The coach noticed the boy immediately because he was making some incredible moves on the little league football field. “His father looked over at me and said, ‘Now Mike, he’s only five years old, he’s not eligible to play yet,’” said Dr. Michael J. Henry, chuckling at the memory. 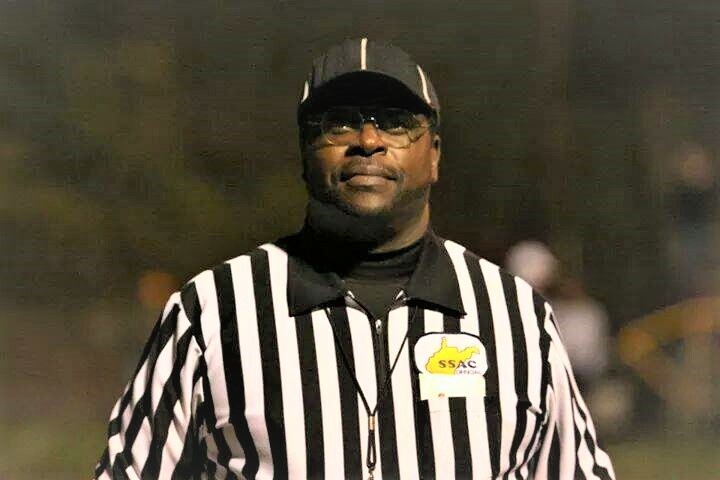 Henry, professor/director of Student Support Services at Southwest Virginia Community College, got his chance to coach and guide the then tiny gridiron phenomenon the very next year. For the next 12 years, as the young man grew from a child into a young man, Henry, along with other coaches, was there giving advice, teaching him football plays, and checking on his grades to make sure that his future came first, even before football. “I would tell my players that not everyone will go to the NFL, but that they needed to focus on academics. A good education will usually take you further than sports,” said Henry. He would ask to see their grades. He would encourage them to do their homework. When the young man went to Marshall University to play college football, he was ready to be a success both as an on-field warrior and as a student. “The way I coached wasn’t all about him and the rest of the team playing football,” said Henry. All of the training and dedication, both on the part of the superb football player and the dedicated coach paid off. The tiny boy with the incredible moves at age five had grown into a pigskin juggernaut. Ahmad Bradshaw was drafted in the 2007 NFL Draft to play for the New York Giants. Dr. Michael J. Henry (far left, referee) is shown during a game. Bradshaw was just one of dozens of boys and girls that Henry’s sage advice has guided, both on and off the field. “I think it’s important to teach a young person how to conduct themselves in a manner that will be beneficial to them, while playing ball or sitting during a job interview,” said Henry. For almost 40 years, Henry has worked with his passion, sports. He has served as a coach for male little league and high school football, baseball, and basketball teams. He has also lent his expertise to girls’ basketball. For a man who is hesitant to talk about his achievements, he was very animated when speaking about the student athletes’ accomplishments and his own. “During the era, in the mid-1990s, Graham High School was on the winning map. They won the State Football Championship. His oldest son, Michael Henry II, was playing that year. He was in the 10th grade. Henry’s appearances on the field were not limited to the role of coach. 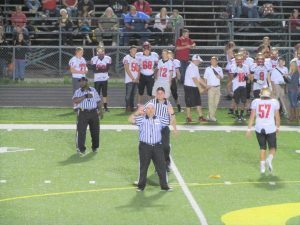 He has served as a Class I Virginia/West Virginia High School Football League referee for 27 years. When called, Henry has also officiated at college and semi-pro games. It is with the same passion that he has poured into local sports over the years that he brings into the office every day at Southwest Virginia Community College. His compassion and guidance makes him a sought after campus resource. He learned that compassion in the home of his father and mother, George and Margaret Henry. George was a disabled coal miner who grew up in the “hollers” around McDowell, West Virginia. His mother was a homemaker. The hard working family man broke his back in a mine accident in 1958. Leaving Henry, the youngest of eight children, to experience the poverty of subsiding on social security disability. His deep roots in the region and his own experiences have developed a level of understanding for SWCC students that has led to his successful guidance of hundreds, if not thousands of students. Students, many of whom upon graduation, have been employed in careers and industries across the country and the world. Education is something that he was led to by his brother. “When I arrived on the campus of Blueifield State College, I had no idea which subject I wanted to study,” said Henry. “My brother, Clinton, who went on to be the Director of Special Education in McDowell County said, ‘Education.’ His reasoning was that, ‘as long as there are kids, there will be jobs in education,’” Henry said, with a slight smile. He is so well thought of in his field, that he was recently awarded the Walter O. Mason Award for Leadership in TRIO Programs, their highest honor. The award was given in San Diego, California. Henry also won the Bluefield College Professor of the year award in 2008. He has worked part time for the institution as a core professor in the Organizational Management and Leadership program. He has served on the Board of the National Council for Opportunity in Education for 12 years. The organization keeps TRIO Programs up-to-date on changes and updates in policies from the U.S. Department of Education, as well as, legislative actions. Even though he has many other awards and activities on his resume, including being a popular commencement speaker, the two things that keep him grounded are the most important to him, church and family. Henry is chair of the Deacon’s Board at the Tabernacle Baptist Church in Bluefield, Virginia. The church feeds his soul, but his family sets the foundation for his life. Dr. Michael J. Henry, who rose from a mountain holler to eventually earn a Doctor of Education degree from East Tennessee State University, took that knowledge and background onto the sports field and halls of academe. He has made his mark in both arenas. The impact that Henry has had on this region cannot be measured. It was the time, energy, and compassionate advice that he poured into dozens, if not hundreds, of young men and women athletes that has left an indelible impression on each of them. Many of whom grew up to retain an involvement in sports, both volunteer and professional. In a sense, paying Henry’s good work forward. To a child with dreams of one day standing amongst the titans of sports, a coach stands even taller. To them, he is a gridiron hero.